I guess it’s his drag name now? 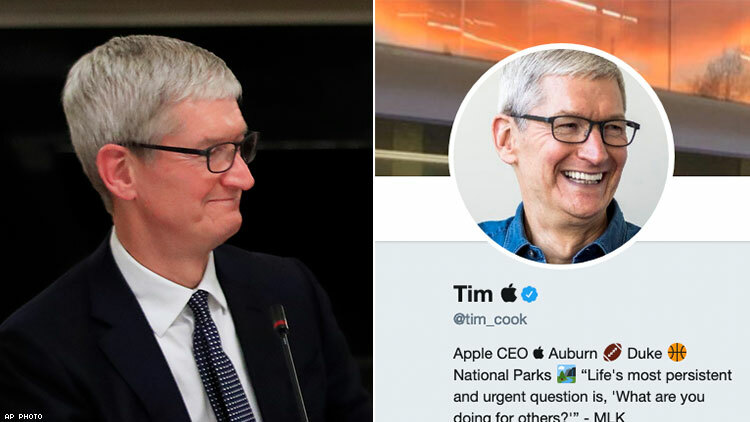 UPDATE 3/7/19 (5:00pm ET): Proving himself to be a master of subtle shade, Tim Cook has changed his Twitter name to Tim Apple — well, the Apple symbol, that is. The iBooks library is open. Cook was at the White House for a meeting of the American Workforce Policy Advisory Board, speaking about technology and employment. This comes two months after Cook was spotted having lunch with openly homophobic Brazilian president Jair Bolsanaro. Tim, you’re the most powerful gay man in tech, why do you keep hanging out with fascist dictators? “We’re going to be opening up the labor forces because we have to,” said the (not my) president during the Advisory Board meeting. “We have so many companies coming in. People like Tim — you’re expanding all over and doing things that I really wanted you to do right from the beginning. I used to say, ‘Tim, you gotta start doing it here,’ and you really have, you’ve really put a big investment in our country. We really appreciate it very much, Tim Apple.” Yes, there is video. This has obviously proven to be excellent fodder for Twitter. Calling Tim Cook Tim Apple to his face is my version of the American dream. I want to look Bill Gates in the eye and call him Jim Microsoft.